If you work in an office environment, you’ve probably noticed that your desk-life takes a toll on both your mental and physical health. 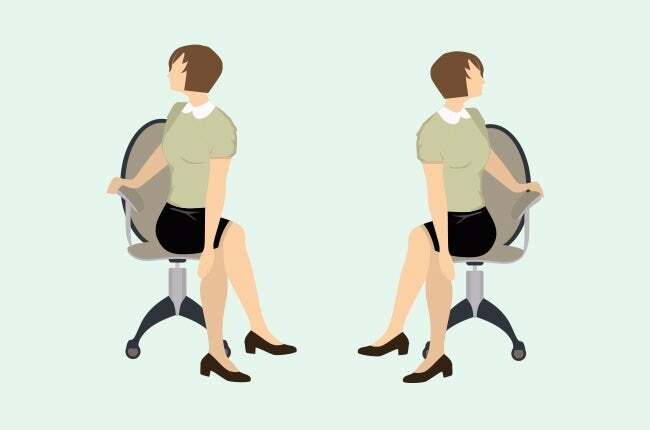 Studies have shown that too much sitting, either at work or at home, can lead to weak muscles, reduced blood circulation, inflammation, and even a bad immune system. It’s no wonder you don’t feel like yourself after staring at a computer for eight hours straight. Fortunately, there are ways to improve your health and comfort without quitting your desk job. 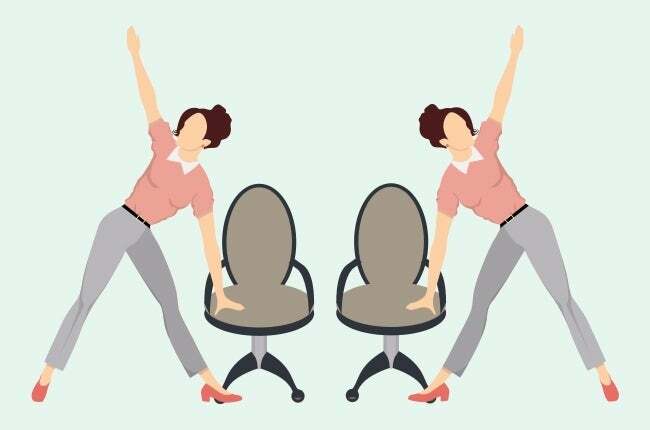 A recent review of stretching programs found that by just relying on different stretches throughout the day, you can reduce your pain and improve your posture substantially. Plus, the additional exercise can improve your overall emotional and bodily wellbeing. 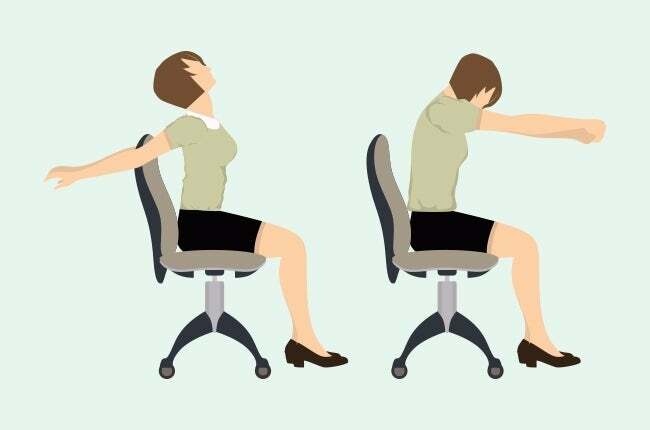 Although it might seem weird to do a mini-yoga session in the office, these 16 moves will transform the way your body feels after a long day of sitting behind a desk. Give a few of them a try and see how different your back, shoulders, neck, and arms feel at the end of your shift. 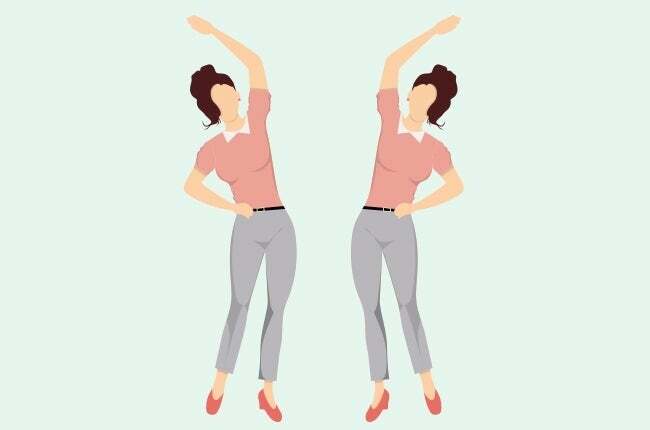 What It Stretches: By pulling you one arm across your body with your other hand, you’ll give it a long, well-deserved moment of flexibility. Why It’s Important: Holding your arms at the level of your desk while typing or doing other kinds of work isn’t actually a natural pose for your body. This move helps release the tension that can gather in your shoulders and upper arms. What It Stretches: This move targets the muscles in your back that help stabilize your spine, both while walking and sitting. Why It’s Important: By strengthening these supportive muscles, you can improve your posture and prevent slouching, which can lead to back pain and a bad hunch. What It Stretches: While transitioning to a standing position and lifting your leg, you’ll be targeting numerous spots, including your thigh, lower back, and arms. Why It’s Important: Although seated stretches can be beneficial, don’t forget that your legs crave standing at least once an hour. This move in particular will give your thighs the stretch they’re really dying for. What It Stretches: Feel that tightness and ache in your sides? That’s because the muscles around your spine and shoulders are feeling cramped. This move helps loosen them up. Why It’s Important: If you want to avoid upper and lower back pain, leaning side to side and really stretching those spinal muscles is key. 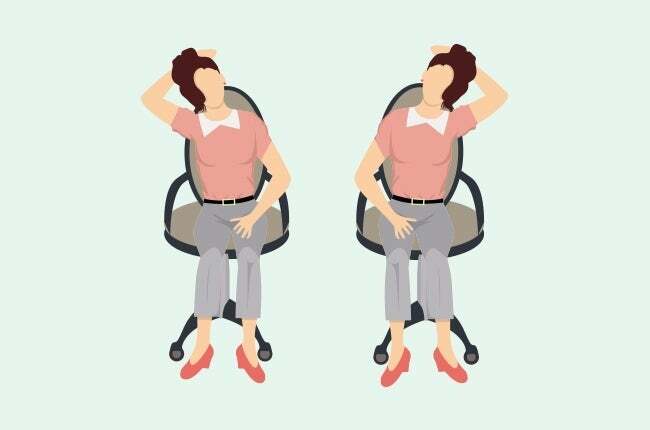 What It Stretches: As you lengthen your arms to reach to and away from your chair, your torso will feel much less tense. 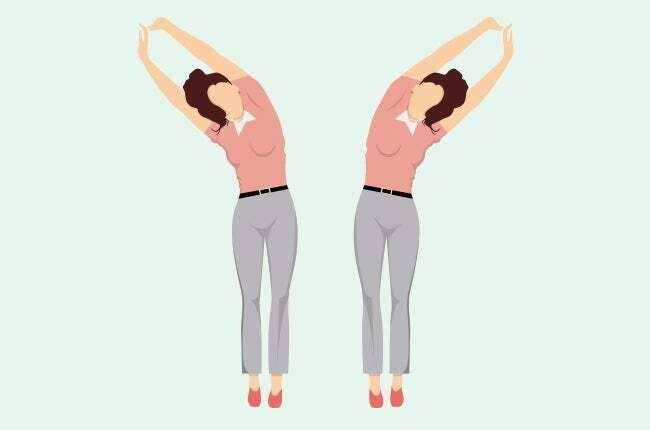 Why It’s Important: Like many of these moves, this one focuses on lengthening your torso, which will improve your spine and body’s overall health. 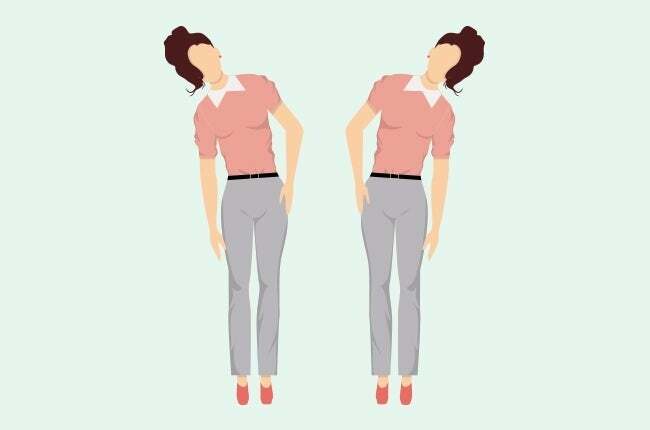 What It Stretches: As you twist your neck and move it around, you’ll target the muscles that get achy from supporting your head all day. Why It’s Important: Staring a computer screen can be really hard on your neck muscles, but by rotating them and giving them a nice stretch, you can prevent annoying stiffness. What It Stretches: When you sit at a desk, especially when working on a computer, your chest can constrict, leaving your shoulders tense and uncomfortable. This move targets that problem. Why It’s Important: Just holding this pose for ten seconds can leave your chest feeling lighter and less tight than it did before. 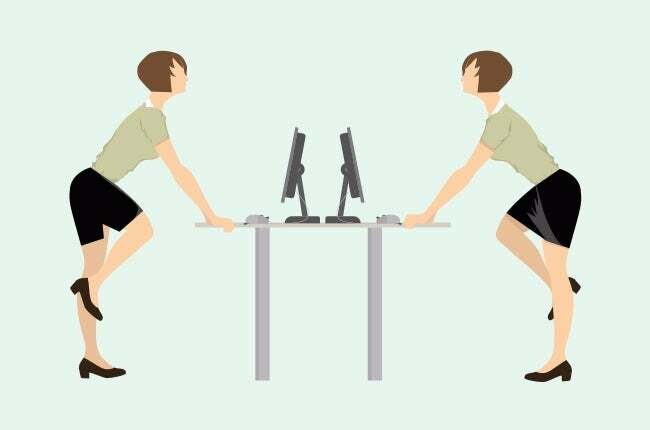 What It Stretches: Your knees and legs spend most of the day bent while you sit at the desk. This move gives them the chance to straighten out and feel flexible. Why It’s Important: Tight thighs and calves are no fun, but with this move, you can give your legs a little extra attention without even getting up from your seat. What It Stretches: Twisting without even standing up gives the muscles around your spine a chance to relax. Why It’s Important: As you sit at your desk, your spine slowly acquires more stress and tightness. This seated twist allows you to improve flexibility and reduce the distress. What It Stretches:This move lengthens your torso and relieves some of the pressure placed on your back. Why It’s Important: As you hunch over your computer and get your work done, your torso can feel squashed and uncomfortable. Therefore, it’s important to stretch it out every hour or so. What It Stretches: As you switch from side to side, you’ll feel the stretch deeply in the sides of your body near your ribs and stomach. 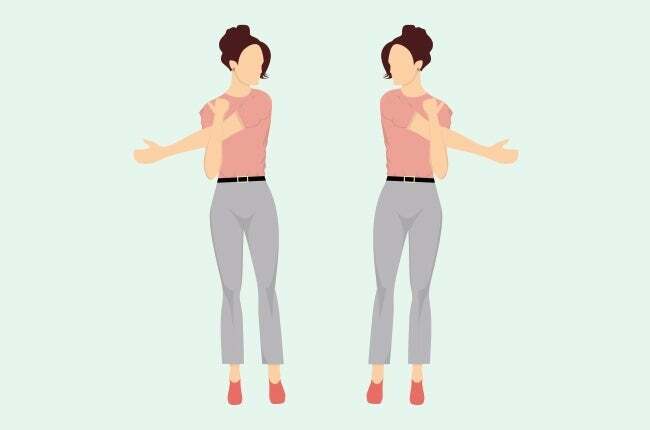 Why It’s Important: Not only does this move release the tension that’s formed in your shoulders and back, but it also helps lengthen your spine, which prevents hunching and bad posture. What It Stretches: Gently pulling your bent knee towards your chest and target your lower back, pelvis, and legs. Why It’s Important: Even if your knee doesn’t come all the way to your chest, you’ll target several areas of your body at once, leaving you less tense afterward. 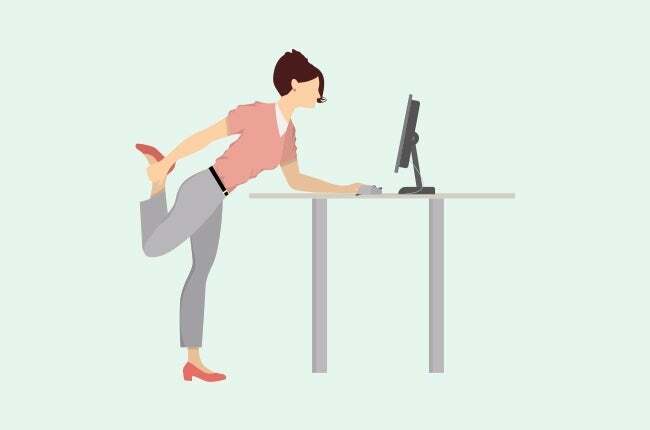 What It Stretches: While using your desk for support, you can try this move whenever your legs and back start to feel stiff. You should feel the stretch predominantly in your hips and thighs. 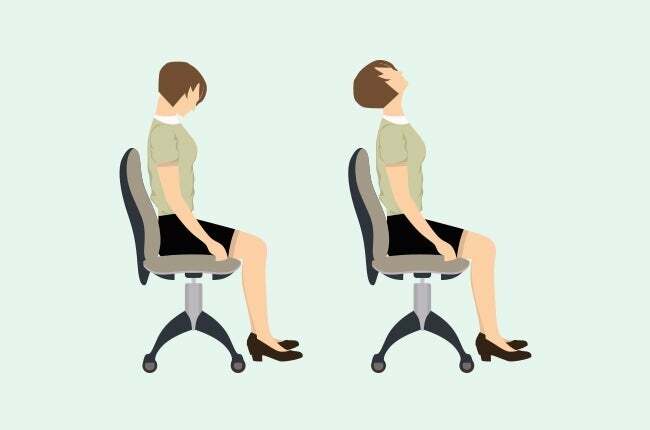 Why It’s Important: Sitting puts a great deal of pressure on your lower back, but opening up your hips and combating the tension can prevent you from feeling the pain later. 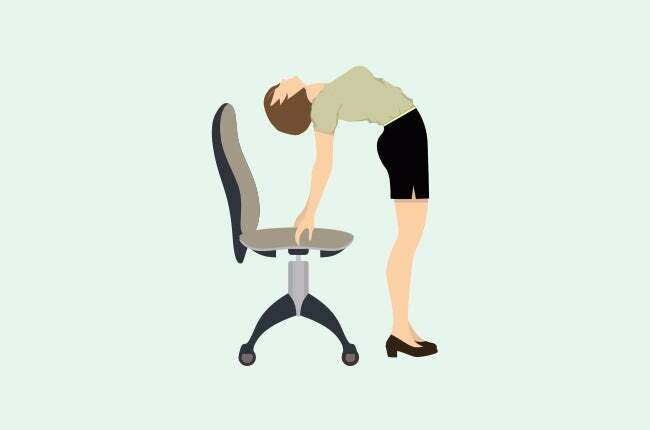 What It Stretches: As you brace your hands on the desk and extend your back to form an upside down L, you’ll find that some of the tension gathered in your lower back disperses. 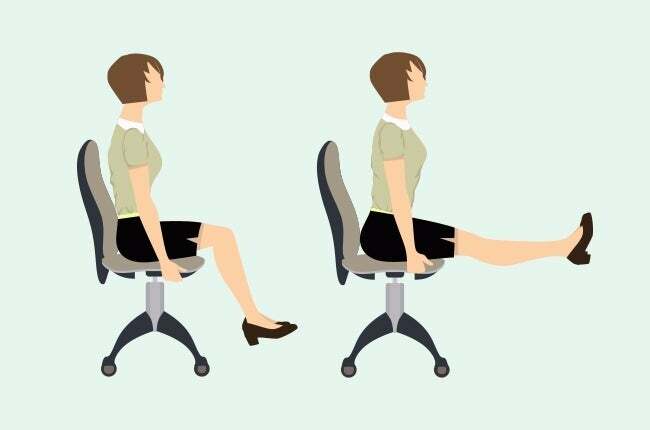 Why It’s Important: The way you sit at your desk probably places an enormous amount of stress on your lower back, but this move can help alleviate some of that discomfort. 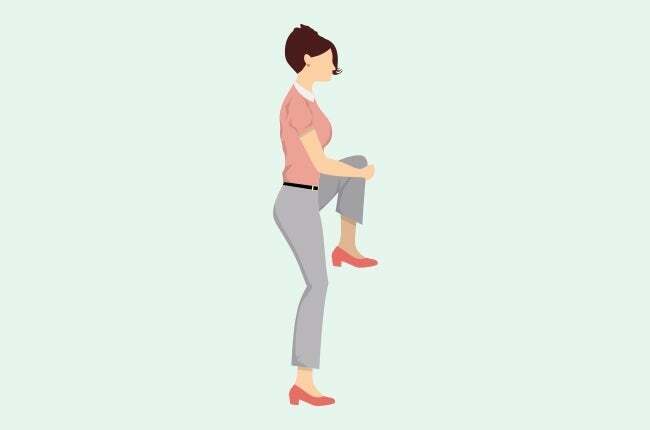 What It Stretches: Bending over and reaching for your toes helps loosen your hamstrings, which are probably extremely tight after hours of sitting in a firm chair. Why It’s Important: More often than not, lower back pain is caused by sitting and not stretching your hamstrings. 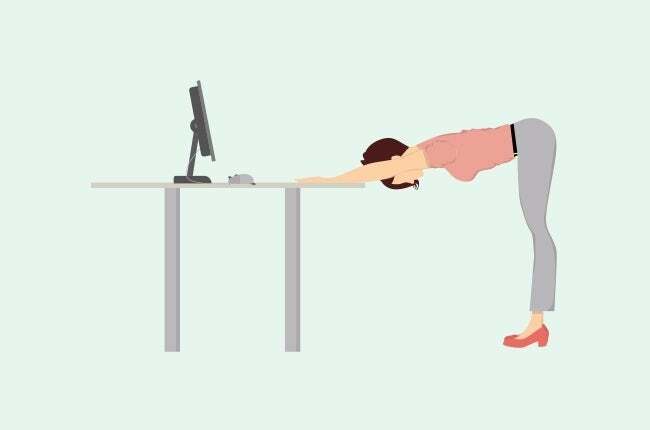 What It Stretches: Obviously, this move targets your stiff neck that’s been holding your head up while you stare at a screen for hours on end. Why It’s Important: Although there are other neck stretches on this list, it’s important to rely on a variety in order to appropriate stretch out every muscle. Don’t wait to start feeling more comfortable at work. Try out some of these moves and see which ones leave you feeling energized and refreshed.